IowaWatch show Iowa Public Television programmers ‘Breaking The Cycle’ during a screening on May 28, 2014, in Johnston, Iowa. 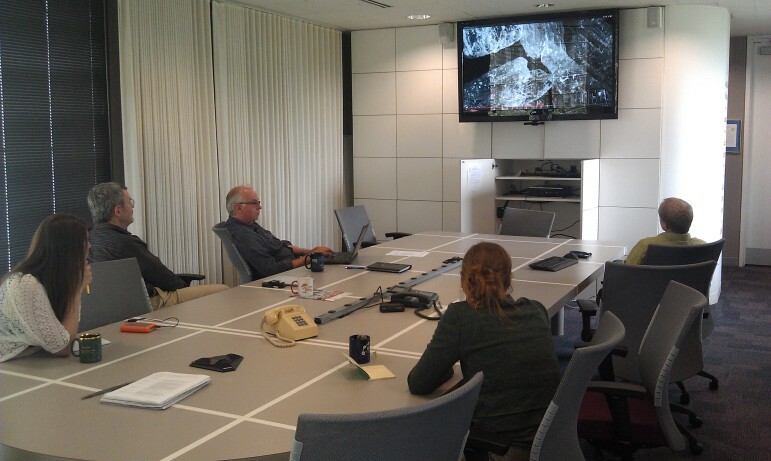 Former IowaWatch reporter Katie Kuntz worked with programmers to ensure that her report met IPTV’s technical and journalistic standards. The Katie Kuntz documentary for IowaWatch, “Breaking the Cycle: Meth Addiction in the Heartland,” premiered at 8 p.m. Monday, Jan. 5, on Iowa Public Television’s World channel – .3 on the statewide network’s digital television channels. 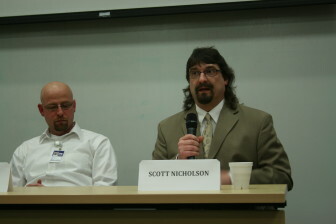 Panelists talk about curbing meth abuse at a July 1 IowaWatch/Council Bluffs Nonpareil forum in Council Bluffs. 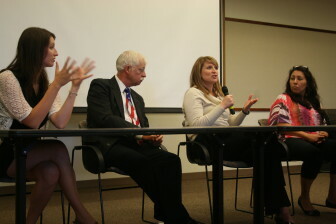 Left to right are: Katie Kuntz, producer of an IowaWatch documentary ‘Breaking the Cycle: Meth Addiction in the Heartland’; 4th Judicial District probation officer Keith Roman; Alegent Creighton Health Director Haley Ehlers; and addiction treatment counselor and recovering meth addict Glennis Guerrero. Iowa has seen an increasing use of methamphetamine, a dangerous, synthetic concoction of chemicals that can give users an artificial high. “Breaking the Cycle: Meth Addiction in the Heartland,” shows the impact meth has on Iowa children raised in a home with an addicted parent. 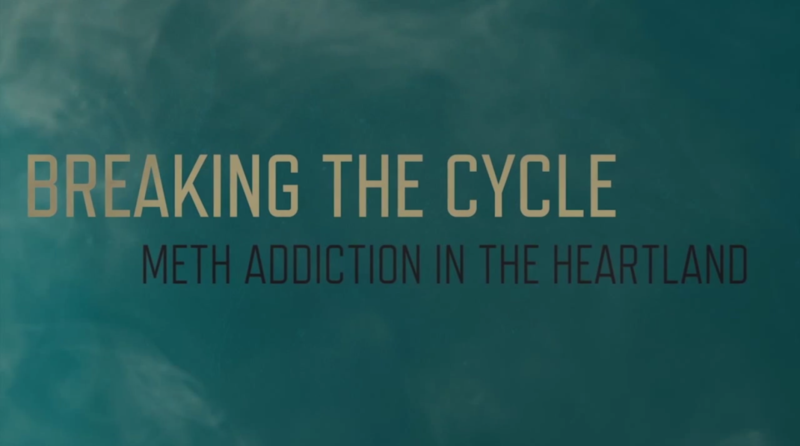 View the IPTV site for “Breaking the Cycle: Meth Addiction in the Heartland.” For a behind-the-scenes look at how this documentary was reported go to this link. The Iowa Center for Public Affairs Journalism, which runs the nonprofit news organization IowaWatch.org, has shown the documentary at three public forums in Iowa: in Council Bluffs of July 1, 2014; Des Moines on Nov. 19, 2014; and Iowa City on Nov. 20, 2014. 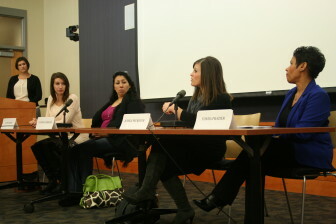 Panel discussions followed each showing. A panel of experts on meth addiction listen as former IowaWatch reporter Katie Kuntz, now with Rocky Mountain PBS I-News in Denver, talks about what she learned when producing a documentary, “Breaking the Cycle: Meth Addiction in the Heartland”. 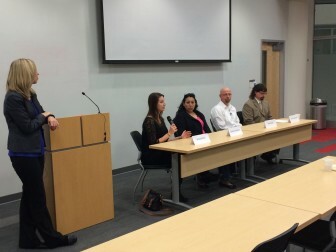 Pictured are (left, standing) panel co-moderator Amalie Nash, executive editor and vice president for news and engagement at The Des Moines Register, and panelists (left to right from Kuntz) Glennis Guerrero of Council Bluffs, Powell Chemical Dependency Center counselor Mike Edens, and Jasper County Assistant Attorney Scott Nicholson. Jessica Peckover, Johnson County Sheriff’s Office jail alternatives coordinator, speaks at an IowaWatch/Iowa City Press-Citizen forum in Iowa City on Nov. 20, 2014, about fighting meth abuse in Iowa. Other panelists are, left to right, former IowaWatch reporter Katie Kuntz, Glennis Guerrero of Council Bluffs and, to Peckover’s right, MECCA Services clinical director Fonda Frazier. Former IowaWatch reporter Lu Shen has won a Society of Professional Journalists’ (SPJ) Region 7 Mark of Excellence Award for a story she wrote about University of Iowa difficulty in 2013-14 helping Chinese students adjust to Iowa. The award was announced at a regional meeting March 30 in Omaha, Nebraska.